Goose Island's Bourbon County stout ain't my favorite stout, that would be Avery's abstruse and aggressive Mephistopheles. 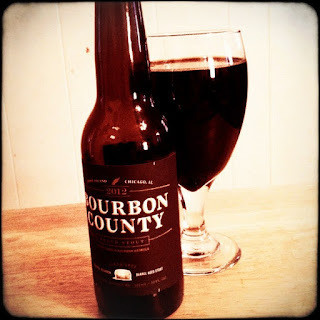 But Bourbon County more than lives up to it's substantial hype. The deep brown color, with blood red highlights and absolutely no head, announces something different right from the pour. Then, the huge bourbon and vanilla warmth in the aroma really demands your attention. But the flavor is astonishing. It keeps every promise the presence makes, and then some. The vanilla and bourbon sets a stage for other tones; candied fruit and walnuts, molasses and a delicious, roasted malt. Bourbon County is hard to track down, but not one to pass up.